The R.W. Kern Center recently became one of only 18 projects to be certified as a Living Building by the International Living Future Institute (ILFI). Finished in 2016, the Kern Center was built as part of Massachusetts’ Hampshire College and houses its admission and financial aid offices, several classrooms, a student lounge and cafeteria. The 17,000-square-foot building is the largest higher-education project to be certified under ILFI standards. According to ILFI’s website, Living Buildings “strive for net-zero or net-positive energy, are free of toxic chemicals and lower their energy footprint many times below the generic commercial structure.” To be Living-Building certified, Hampshire College had to send in a year’s worth of usage data showing that the Kern Center used a net-zero amount of water and energy, and that it generated a net-zero amount of waste.It also had to demonstrate that the Kern Center was built without 20 toxic chemicals on the Living Building Challenge Red List. To achieve these objectives, architectural firm Bruner/Cott & Associates put significant thought into the building’s ecological footprint. The Kern Center collects rainwater, treats its own greywater, uses composting toilets to reduce water use and generates 17 percent more energy than it uses via roof-mounted solar panels. The building itself is made from Forest Stewardship Council-certified local wood and schist from a nearby quarry. It also boasts views of the surrounding meadows and mountains. The Living Building Challenge was established by the Cascadia Green Building Council in 2006 to promote sustainability above and beyond other green certification programs, such as Leadership in Energy and Environmental Design (LEED). 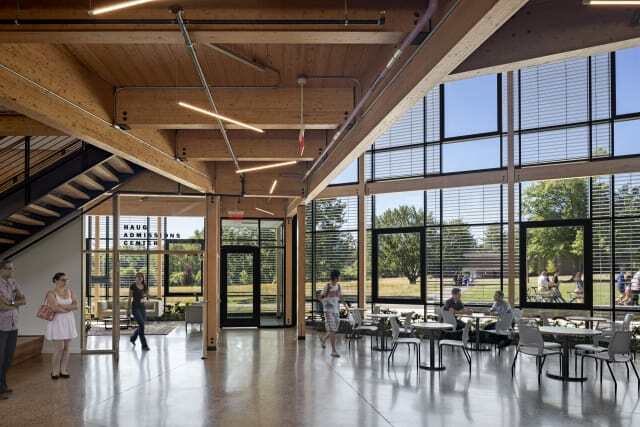 In 2010, the first two Living Building certifications were given to the Omega Center for Sustainable Living in Rhinebeck, New York, and Tyson Research Center of Washington University in St. Louis. The Omega Center, part of the Omega Institute for Holistic Studies, is a wastewater filtration plant that uses treated water for garden irrigation and its visible, accessible inner workings to teach students about water recycling. The Tyson Research Center, an environmental field station, boasts a sustainable native garden, runoff friendly concrete and a multipurpose classroom. While much smaller than the Kern Center, the two pioneering Living Buildings share its commitment to sustainability. At Hampshire College, the Kern Center has become not only a community hub but a teaching tool, inspiring a new generation of architects to dream.